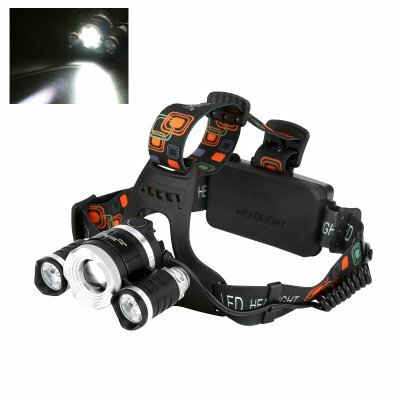 Successfully Added CREE XM-L T6 LED Headlamp - 2400 Lumen, 3 Cree LEDs, 4 Light Modes, Adjustable Head Strap, Zoom Function to your Shopping Cart. With a bright 2400 lumens of light this CREE LED headlamp can illuminate wherever you cast your gaze letting while letting you keep both hands free. This makes it an essential part of any tradesperson or mechanics kit, allowing you to operative in dark areas without needlessly preoccupying your hands. It's also ace for camping or treks, ensuring that should you get caught out after dark you can easily light your way home. This headlamp with 3 CREE XM-L LEDs can penetrate well into the night sky and with 4 easily adjustable settings you can chose between having a single, double or triple LEDs lit up. There is also a focus wheel allowing you to widen of narrow the light, this makes it easy to light up large spaces or hone in on specific details. Made from a durable and tough aluminum alloy makes this a very robust head torch and its water resilient design allow it to be used in inclement conditions. This CREE T6 LED Head Torch comes with a 12 months warranty. Brought to you by the leader in electronic devices as well as wholesale LED Lights..